President-elect Barack Obama says despite the enormous task a head, he's as hopeful as ever that the U.S. will endure and prevail and fulfill the dreams of its founders. Obama addressed the crowd gathered for a celebrity-packed concert at the Lincoln Memorial Sunday. Some estimates put the attendance as high as several hundred thousand. Crowds gathered on the National Mall for the "We Are One" concert on the steps of the Lincoln Memorial. 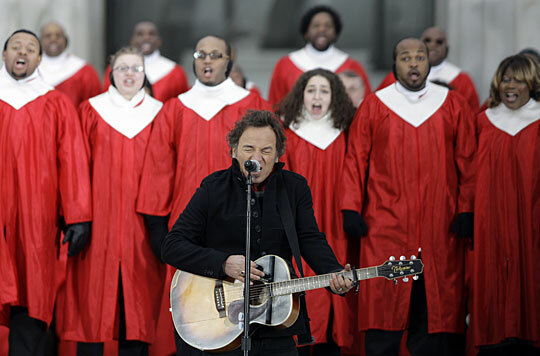 Bruce Springsteen sings "The Rising" in front of a choir at the opening celebration for the inauguration of Barack Obama. On a darkening day in the nation's capital, President-elect Barack Obama on Sunday mounted the storied steps of the Lincoln Memorial and, during a star-studded concert, urged a massive crowd to join him in tackling the raft of challenges the country will face when he takes the oath of office Tuesday. "In the course of our history," he said, "only a handful of generations have been asked to confront challenges as serious at the ones we face right now." There is war and economic crisis, he said, and Americans are losing their homes and jobs, and struggling to pay their bills. "I won't pretend that meeting any of these challenges will be easy," Obama said, predicting hard times for a potentially long time. "It will take more than a month or a year, and it will likely take many." But the president-elect, hatless in the cold and wearing a dark topcoat, returned to his consistent campaign themes of hope and hard work. He made reference to those who came before him — including the late civil rights leader Martin Luther King, who from the same steps in 1963 gave his seminal "I Have a Dream" speech — and returned to his central message of hope. "As I stand here tonight, what gives me the greatest hope of all is not the stone and marble that surrounds us today, but what fills the spaces in between," he said. "It is you — Americans of every race and region and station who came here because you believe in what this country can be, and because you want to help us get there." As he has been doing since his long-shot campaign began two years ago, Obama implored Americans of every political persuasion, color, ethnicity or sexual preference to help him "carry forward as one nation and one people, the legacy of our forefathers that we celebrate today." 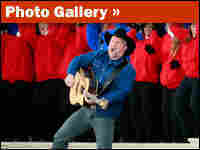 Tens of thousands of people had bundled against the cold and descended on the National Mall for the free concert and Obama's appearance in what was billed as the official start of festivities leading to his Tuesday inauguration. 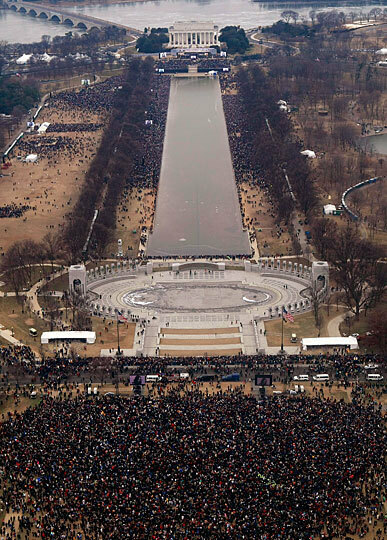 The crowd filled the spaces alongside the reflecting pool in front of the memorial, then stretched for hundreds of yards down the National Mall toward the Capitol. Obama, his wife, Michelle, and their two daughters, along with Vice President-elect Joe Biden and Biden's wife, Jill, watched the concert from the Lincoln Memorial steps. Artists who performed during the concert ranged from Bruce Springsteen, who opened the show with his gospel-like hit, "The Rising," to Beyonce, who closed it with "America the Beautiful." 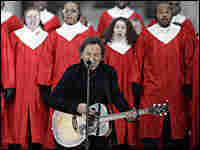 Other featured performers included U2, Garth Brooks, Stevie Wonder and 89-year-old folk singer/activist Pete Seeger. For Nancy Demmelmaier, 62, of Orange County, Calif., the "We Are One" celebration — and its promise of lighter security and fewer spectators than anticipated on Inauguration Day — was more about getting a glimpse of Obama than a favorite artist. "We think this is our only opportunity," said Demmelmaier, who watched the event with her husband. "We missed Woodstock, so we're making up for it now," she said. But the sea of faces under cloudy, chilly skies largely reflected the younger demographic that Obama successfully mobilized during his campaign. Recent college graduate Sam Salkin, 22, arrived almost six hours before the 2:30 p.m. ET event to stake out a patch of ground with friends from George Washington University. Obama's election "showed that a lot of the little things we did really added up to something," said Salkin, who donated money and volunteered for the president-elect's campaign. Though the crowd and much of the city were in a celebratory mood, Obama's day began on a much more somber note at Arlington National Cemetery. In a traditional event that carried the weight of transition, the nation's soon-to-be commander in chief laid a wreath at the Tomb of the Unknowns. Biden, who had joined Obama on Saturday on a whistle-stop train tour from Philadelphia to the nation's capital, was at his side. They stood in silence as a soldier played taps. And while the crowd gathered on the Mall for the concert, the Obama family worshipped at the Nineteenth Street Baptist Church. It is considered one of the city's most historic African-American churches. Congregants who packed the church stood and cheered when Barack and Michelle Obama, their daughters, Malia and Sasha, and Michelle's mother, Marian Robinson, were introduced. They also applauded when a young boy from the children's choir stepped to the microphone and invoked the words of the spiritual made famous by the Rev. Martin Luther King: "Free at last, free at last, thank God almighty, we are free at last." Monday is the national holiday celebrating King's birthday, adding significance to Obama's upcoming inauguration as the nation's first African-American president. There were stark reminders Sunday not only of the hope that many Americans place in the president-to-be, but also the daunting problems he and the nation face. A new New York Times poll found that 79 percent of those surveyed said they were optimistic about the next four years under Obama. But more than 80 percent said the nation is in worse shape than it was five years ago, and two-thirds believe the current recession will extend two years or longer. During a pre-recorded interview with CNN's John King that aired Sunday morning, Obama was asked when the economic bleeding would stop. "We're going to have a tough year in 2009," he said, before touting the 3 million to 4 million jobs he says his stimulus plan will create. And he said he hasn't made a final decision on when he would propose rolling back President Bush's tax cuts for the wealthy, acknowledging that it "might take a little bit longer" than once expected. In a live appearance with King, Obama's top strategist, David Axelrod, invoked the great scope of the national emergency and urged Democrats and Republicans to come together. Axelrod also defended the Obama transition team's decision to sell exclusive television rights to Sunday's concert on the Mall to HBO for $5 million. The transition and inauguration have been expensive, Axelrod said, and "this is a way to defray some of those costs." Come Wednesday, there will be no corporate underwriting of the nation's financial woes. But until Tuesday, the celebration continues.